I think an uneducated, ignorant mob is more dangerous. I like your style Antares. Your poster says so much with so little words. Thank you. Think about it, Gingertom: why are there "uneducated, ignorant" mobs? Did God create them... or God's earthly representatives, the Great Monarchs - whom we call Rajas and from which the word Kerajaan derives (though some witty chap recently twisted the word into Kera-jaan :-). Why would the ruling elite want to keep the masses uneducated and ignorant? The easier to rule them, and the less wages to pay them perhaps? See what happens when people get too well educated - they form NGOs and stir up a lot of muck, demanding higher wages and lower prices. Dammit, if their demands are met, who can afford 200-room mansions and 1200 servants? That would cramp our lifestyle, no? 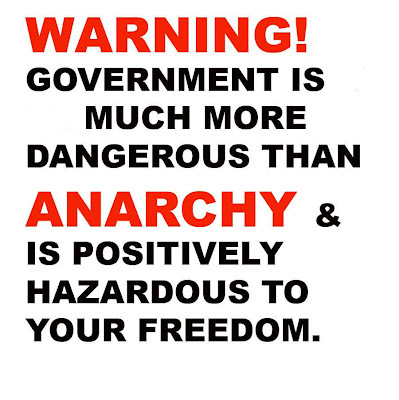 :-) Obviously, the word "anarchy" makes you imagine unruly mobs. May I suggest you refer to a recent blogpost on the real meaning of "anarchy"? Appreciate your compliment, Dragonfly, thanks.